This app is amazing I used it last year as well I 100% recommend if you need extra Christmas spirit then get this app!! I love Christmas count down!! I know I am writing this a day before Christmas but I love this app, I didn’t know it could calculate how many breaths, heartbeats, seconds, sleeps, hour, weeks, and days. This has all the information you need, I thought it was helpful to look at it to help me see when I should go Christmas shopping, not to early, not to late. If you are reading my review, I am definitely saying you should get the app. There should be a Santa tracker attached to this. Amazing for Such a Simple App! This little app is very cool to have when Christmas is near. I love the heartbeats and breaths counters. I definitely prefer this one over all the others because of the cool measurements added, such as breaths, sleeps, and heartbeats. I love the Christmas countdown because it helps me see how many days till Christmas!! I love Christmas so much so I got this app because I saw great reviews on it !! I love Christmas so I obviously have to count down! I love how it tells you exactly when Christmas is coming! I love everything about this app,and would recommend to anyone! This game is tots akaw and does not need farts and burps. Any hodad who thinks this can go shove a metal rod down their throat and pull it out their you know what hole. This game is so rad and gets me fully juiced up for Christmas. Promoting my friends the release some gnarly bodily stenches is just not the move. That’ll stop out the Christmas spirit vro. What exact time is it counting down too? And does it just know my location? I thought it was going to tell you how long until Christmas DAY but it only counts down to Christmas EVE. This app is snow fun and I think everyone should own it!! Merry Christmas Eve eve! I do a lot of knitted gifts The countdown keeps me on time. This app is amazing at telling you about Christmas. Also is shows hours minutes sleeps days and more and the Christmas music just makes it even better. But the one this I don’t like is how many notifications you get. I did not look at the app for 2 days and I had about 15 notifications. But overall this is a great app to have when it’s Christmas time. 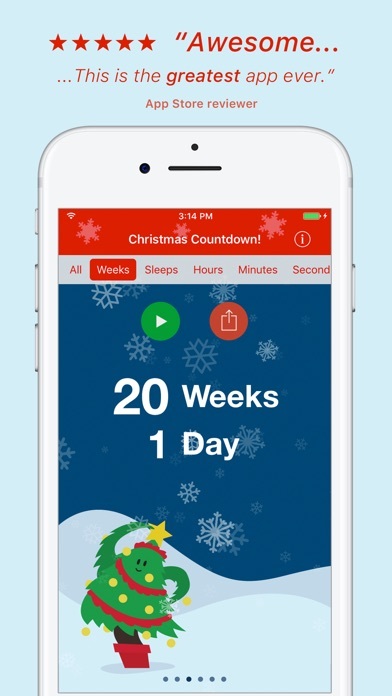 Best count down tell Christmas app EVER ! My daughter and I love keeping track of the countdown to Christmas whether it’s June or December. We especially like knowing the number of heartbeats til the big day. 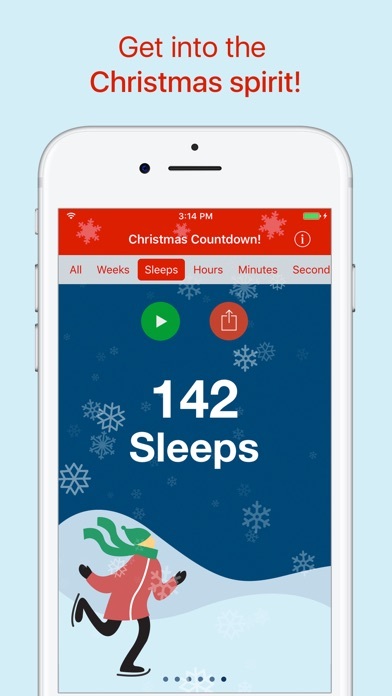 If you are counting down to xmas this app is great! 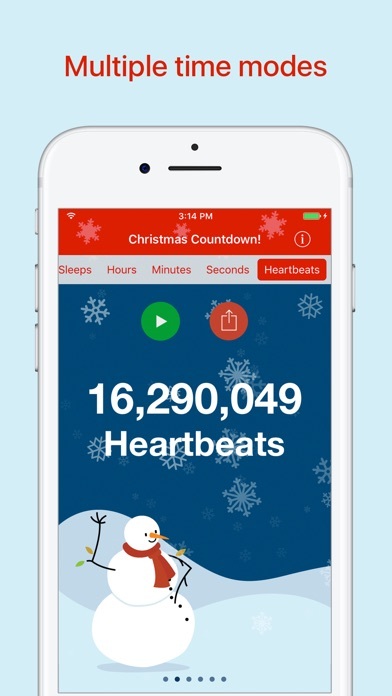 This app has how many weeks, sleeps, days, seconds, heartbeats, and breaths until Christmas! If you let it send you notifications it will tell you how many days exactly until Christmas at 12:00. I really think that this app is very useful. This app is amazing.As a kid I wake up every December morning wondering how far away Christmas is. 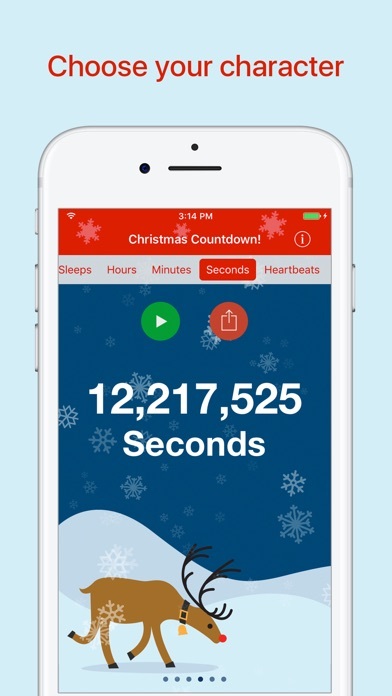 With this app you can know exactly how far away Christmas is.with hours,minutes,seconds, breathes, heartbeats and more. If you are a kid you should definitely get this app. I think that it gives Christmas more hype and when you finally get to Christmas Eve this app makes it more exiting! This app is so creative and it tells you everything! the music is really cute too. the notifications are really adorable. i love this app very much!! merry christmas! This app is so amazing! I’m so excited for Christmas! So this helps me get ready! I hope you love it as much as I do! 🥇😆😁😄 5 STAR ⭐️ APP!!! I find it helpful. It’s an easy way to find how long until Christmas! This game is so good you know when Christmas is here know the days,weeks,hours,sleeps,breaths and even heartbeats!!! This game is so cool you can have so much wall papers to there is a Christmas tree and Santa and even more!! !Download this game RIGHT NOW!!! Holiday App In Da House!!!! Great for telling my children how far Christmas is away. Great app! Runs great! Good effort and layout! This app is wrong on the days minutes,hours, and seconds. This is the best app for a countdown! Everyone should get it! It has seconds, hours, weeks, minutes and even heartbeats!!! Best app ever!! I love this app so much!!! It plays great music and has a ton of different modes. I 100% recommend this app. It’s really good. Very simple and helpful! Thanks! Hey if you are really, super excited for Christmas and can’t wait then download this! This app has heartbeats, seconds, minutes, hours and more!!!!!!!! Christmas will be here before u even know it! So, come on people download this. It’s very exiting and reminds me of Christmas!!!! This app is amazing and is a fun way for kids to countdown to Christmas. It tell lots of different ways too such as how many heart beats, breaths, and sleeps! Kids won’t even be a second off because it tells you down to that too. I hate to say it but there is 11 days till Christmas now and I have been counting down since 70 day! (I think it might be all the Christmas songs and fun texting stickers) I would recommend this app to anyone who loves Christmas and want to count it down! It’s great!! I have this app all ur long! It’s the best countdown app ever! This is a really fun app. It has cute imagery, and music. I find myself looking at it a few times a day. I love this app because Christmas is my favorite holiday and this app has everything from hours to hartbeats. You should definitely get it. It's really cool how it has so many options to see the time! It's also really fun just to see the countdown! I would definitely suggest because it is also really accurate! It’s really fun. You can see heart rates and breaths till Christmas when you’re bored it puts a smile on your face! I think that this app is amazing because it shows you so much things that we didn’t even know. i feel so frickin jolly and MERRY when i open this app. i love christmas time and this makes it even more enjoyable. ily christmas countdown! I just like it period. It is darling! It’s simple and easy. It has some advertising that’s not too obnoxious. This app is simply the best. I just wish that it could be a widget because then I can just slide ti my widgets and see the countdown without opening the app. This app is my favorite thing on my phone when i downloaded it i thought it was just gonna have the days counting down but it comes with sooo much more! I really enjoy this app! I can't believe how accurate it is! It even goes by breathes and heartbeats! All my friends use it so I thought I'd try it and it's AWESOME! It is such a good app!!! It is the best Christmas Counting app there is. This app is so cute and I love using it, it gets me exited for Christmas! Love the little characters too! All I can say is that this app makes my life better! It was great but I wish there would be different time places but in all it is good and love the songs and and how much more joy it gives to me in the holiday season. This is so great because its making me so very great feeling about My Christmas. I love this app because it notifies you when another day passes by till Christmas. I would 100% recommend! I love this app so much it takes the stress of your back of having to search on safari look at Siri and if you have one Alexa and plus all of those apps are not Evan accurate and this app is so detailed it shows breaths seconds heart beats an Evan minutes and you can’t get that off of Siri or safari can you? I like the app. I like apps that tell me how far away Christmas is. This app gives me more than that. It gives me heartbeats, breathes, sleeps, hours, minutes, and more. The only problem with it is, I can’t choose my song unless I upgrade to premium. Which I don’t want to do because it costs actual money. Also the app is a day behind. It only counts days until Christmas Eve, not Christmas Day. But other than that the app is pretty good. I’ve never been more excited for Christmas! There’s no other app that can pump up for something like Christmas Countdown. From the merry music, to the cute characters, and to the tracking and time, no other app can quite compare to Christmas Countdown. But please can we get a simple widget for this?!?! Can't wait to see what the special thing on Christmas will be! I would definitely say it's a buy. I love this app! It would be nice to have more than one backeround song without having to pay money but i guess they gotta earn money from it somehow, and it's a really great song anyway. I definitely recommend this app if you can't wait for Christmas. 5 stars for sure. This app helps keep me on track in the months leading up to Christmas. I love the email and Facebook features. No doubt, hands down best app I have on my phone! I love this app because I love Christmas! HEY!! YOU NEED TO READ THIS RN! Absolutely adore this app! I love Christmas and this app gets me in the spirit. With Christmas just around the corner in October (not really) I am soooo excited! Definitely recommend!!!! This is the best Christmas countdown app! It works fine and you don’t need premium to have a better countdown! Great app, brings so much excitement for my three year old. Fun pictures and simple. I think out of all apps this is amazing. There is no way I am going to buy the full version or this app for a dollar. I am not cheap but really. I rather have adds than pay. Other than that I love looking at this app and everything. It has really nice music and gets me in a cheery mood and shows me everything counting down to Christmas in a heart beat by the way did I mention it counts by heart beats as well?! Amazing app! Ads are barely visible or pop-up, they are small not very visible and Nice. Only I have it on notifications and it won’t send me any :(. Also, there should be a days tab where it says how many days till Xmas including the rest of the day they are in as a day. My by far fav app. I ABSOLUTELY love this app. I use it all the time. My friends know I have OCD (obsessive Christmas disorder) and I make them crazy because I always know how many days until Christmas!!!!! I love the count down ! Love the music! I’m very happy with this app as I can see days and weeks for my shopping and decorating. Too many ads is my only issue. Love this app with all its features! Yea my friends may get annoyed when I pull it out and tell them the exact days, weeks, seconds and heartbeats until Christmas, but it's still one of my favorite apps! Last year, I tried my best to stay up all night to watch it tick down to zero. I sadly failed 😂. But I will try it again this year! Also, I absolutely love the Christmas music in the background. Sometimes when my internet goes out I just pull the app up and listen to that 😂. Never fails to make me happy.